Usually requires a specially designed logsheet. Logsheet may be difficult to remove (tweezers help). Slim Bob Tiny ziplock pouch wrapped in duct tape. 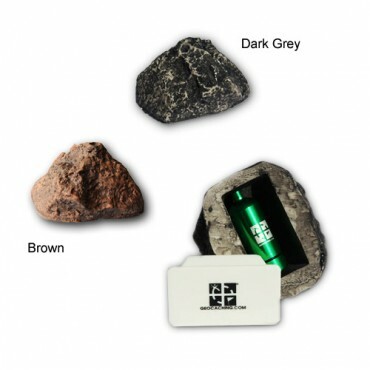 Often held in place by a small magnet inside the pouch or by velcro. Fake Bolt May be in place of a regular bolt, but not always. Pico Tube Waterproof with pop top. Often pushed into soft sand or dirt, or possibly with something attached to the top. 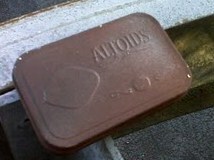 Sometimes used as log holders in a fake object. Larger variations may be considered Micros, but Nanos are most common. Film Canister Probably the most common micro. 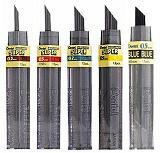 Diabetic Test Strip Container Similiar size and appearance to a film can, but more durable and the lid seals much better making them reasonably waterproof. 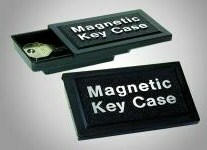 Magnetic Key Case Probably the most common micro cache besides film cans. Almost always attached to a metal object, especially the underside of benches and picnic tables. 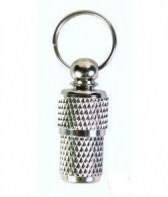 Sometimes attached to a metal plate that is attached to a non-metal object. Key cases with clip tops tend to break the clips and the lid will no longer stay attached. Micros, but sometimes described as nanos. Scuba Bison Bison tube that unscrews from the bottom. Bottom is usually flat rather than rounded like a normal bison tube. 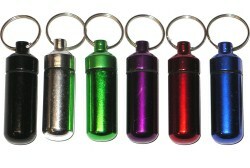 Pill Fob Similiar to a bison tube, but not as waterproof. Usually camo'd as they are sold in bright colors. Sometimes erronously listed as Small. Soda Preform Similiar diameter to a film can or matchstick container, but at least twice as tall. Pill Bottle Empty plastic medicine bottle. Be sure to remove or completely cover all references to medicine! Usually micro, but larger ones may be listed as size Small. Variety of shapes and colors. Normally opened from the bottom. 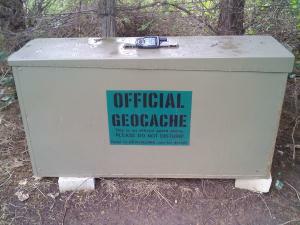 Sometimes created specifically for geocaching, but others may be hide-a-key containers or modified from outdoor lighting holders. Plastic container about the size of two film cans stacked together. Sometimes listed as Small, but really a big Micro. Despite their intended use, these containers are not very waterproof. Decon Kit Military surplus decontamination kit case. 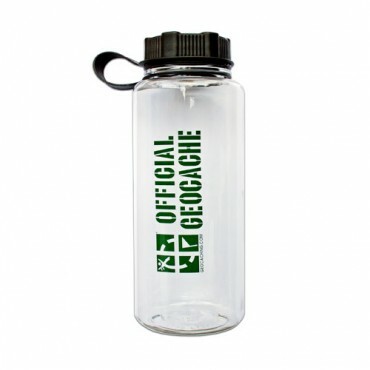 Tough and waterproof if closed properly. 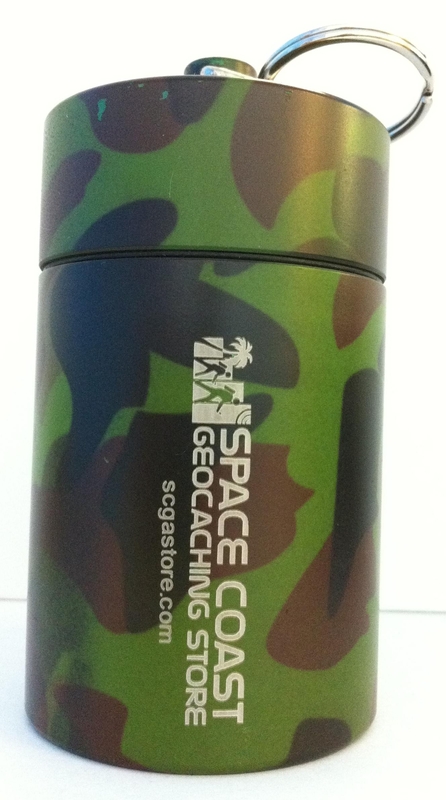 Mini Decon Plastic container designed for geocaching that resembles a Decon. 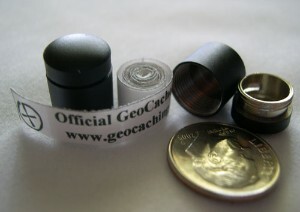 Smaller than a normal Decon, but still big enough for geocoins and smaller trackables. Fake Sprinkler Fake sprinkler hide-a-keys or real sprinklers with the insides removed. Risk of searchers damaging real sprinkler heads in the area. Otterbox Waterproof plastic case with latches and a hinged side. 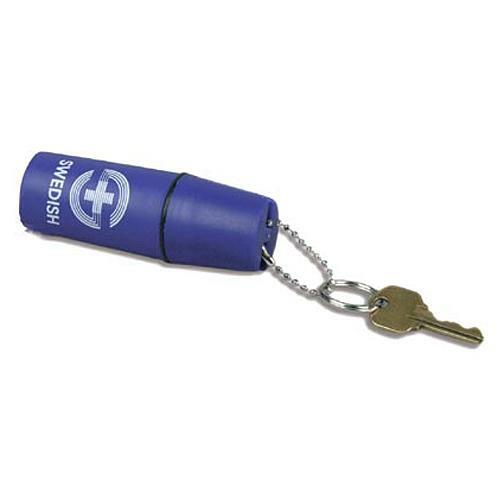 Submergable and more durable than a lock-n-lock, but more expensive. Usually camo'd as they are usually sold in bright colors. Bigger Otterboxes are sometimes listed as size Regular. 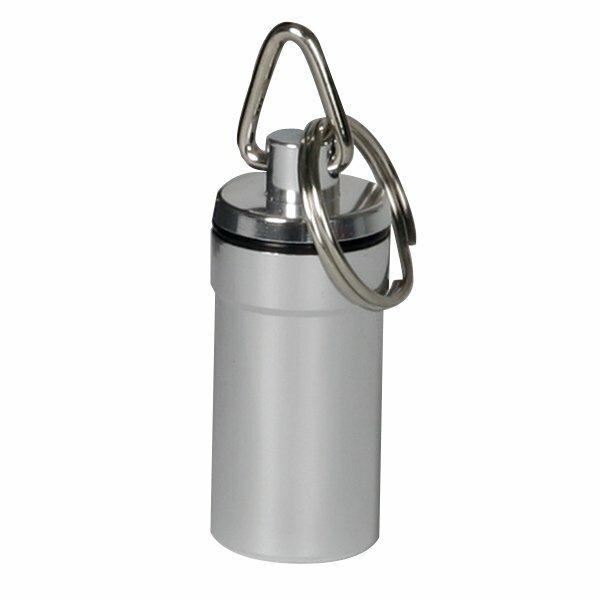 Mighty Mega Capsule Screwtop metal cylindrical container. 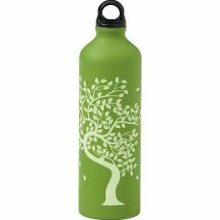 Moderately waterproof, but often less so as the o-ring degrades. Ammo Can Classic geocache container: military suprlus metal ammunition cans. Any military markings or references to ammo should be covered or removed before placement. Latched Tubberware Plastic tubberware container with a latch on each side. Smaller versions are size Small. 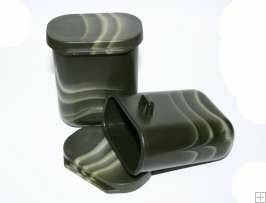 Rubbermade Container Non-latched plastic containers are not waterproof thus make poor geocache containers. 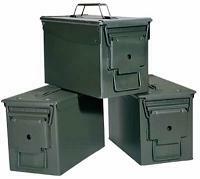 Large Ammo Can Larger military surplus metal ammunition cans. Usually same length & witdth as a regular ammo can, but much deeper (4-5 ft tall). Huge Ammo Can Homemade large ammo can. Often made of plywood or converted from a large metal storage container. Big enough to fit a person inside.